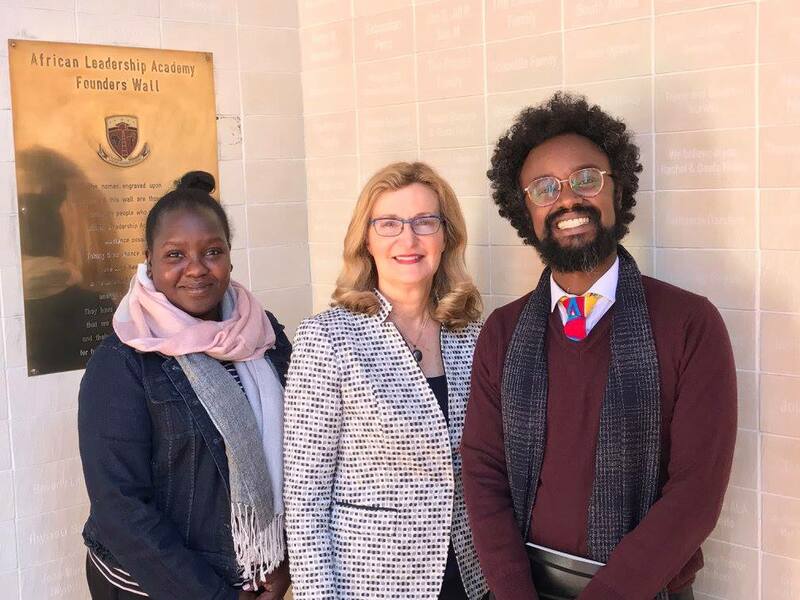 Saint Rose President Carolyn J. Stefanco with African Leadership Academy Director of University Guidance Chemeli Kipkorir, at left, and Dean of the Academy Hatim A. Eltayeb, at right. 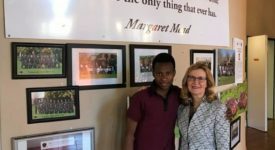 The College of Saint Rose is excited to announce that President Carolyn J. Stefanco has signed a Memorandum of Understanding for collaboration with the African Leadership Academy (ALA). Based in South Africa outside Johannesburg, ALA is a two-year pre-university leadership program that seeks to transform Africa by identifying, developing, and connecting the continent’s future leaders in ways that lead to social change. In support of the global outreach efforts outlined in The College of Saint Rose’s 2020 Strategic Plan, this agreement will lead to cross-continent collaborations on leadership development programs, faculty exchange initiatives, and scholarship opportunities for students. Saint Rose has enrolled its first ALA graduate for the incoming Fall 2018 class, and another student will begin at the College in the Spring 2019 semester. It is anticipated that more students will apply and enroll at Saint Rose in the years ahead. This Memorandum of Understanding is a direct result of meetings and conversations between Stefanco and ALA Dean Hatim Eltayeb about ways in which Saint Rose and ALA could partner to enhance the institutions’ shared vision for global connectedness. The agreement, which is in place through 2020, was signed following Stefanco’s visit to ALA in May 2018. While in South Africa, Stefanco also organized and chaired a panel titled “Higher Education Leadership Development: Problems and Opportunities for Transformational Change (in Africa)” at the International Leadership Association’s Next Generation Leadership Conference at the University of Pretoria. 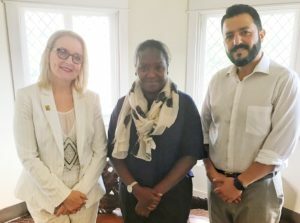 Saint Rose Vice President for Enrollment Management and Marketing, left, with African Leadership Academy Director of University Guidance Chemeli Kipkorir, center, and Saint Rose Assistant Vice President for Global Affairs Emin Hajiyev. Founded in 2004, ALA aims to develop a powerful network of over 6,000 leaders who will work together to address Africa’s greatest challenges, achieve extraordinary social impact, and accelerate the continent’s growth trajectory. 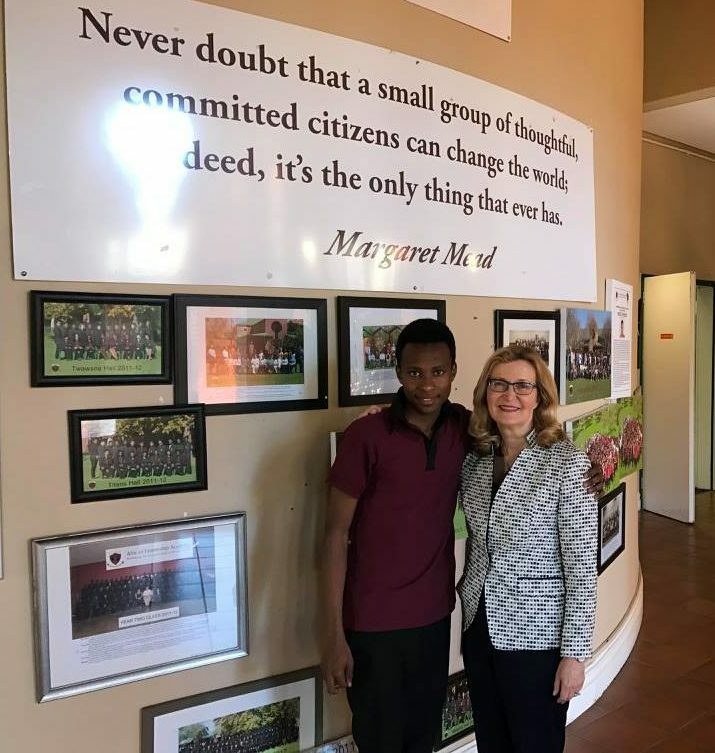 To accomplish these goals, ALA brings together young leaders from across the continent with demonstrated leadership potential, a passion for Africa, an entrepreneurial spirit, and a track record of community service. After graduating, ALA continues to cultivate these leaders throughout their lives, in university and beyond, by providing ongoing leadership training, supporting their growth through access to internships and careers, and connecting them to high-impact networks of people and capital that will empower them to create transformative change. Saint Rose is known throughout the New York Capital Region and across the United States for its international diversity and global connectedness. The College has a growing number of students from outside the United States, and the current student body represents 51 countries.